Generally, I stay away from middle-grade books because it's hard for me to enjoy reading something when the language and plot is aimed at people much younger than myself. However, when I was offered Shine Izzy Shine for review, I just had to say yes - especially when I realised it would feature someone in a coma. I think this is a really interesting and heartbreaking thing that not many authors dare to approach in writing, but if there's one thing I've learned over the past few years, it's that Daines isn't one to shy away from writing about difficult topics. On Rio's wedding day, she falls down the stairs and ends up in a coma. When she wakes up, she genuinely thinks she's fourteen, and suddenly, she's disgusted by her daughter, and even more disgusted by the fact that she was about to get married to a guy over thirty. Shine Izzy Shine explores a family having to deal with this, and even though I don't know anyone in real life who has been in a coma, I think it was very well executed. It was heartbreaking seeing the effect Rio's coma had on her daughter and fiance, and it showed me how badly this can change a family; it's something I'd never really thought about before. The only thing that irked me was when Izzy would send a message to a friend and solely use text speak. Nearly every word was abbreviated, and I would have preferred it if the messages were written normally, especially as Izzy seemed really smart. I also think seeing these text messages had a negative effect on the flow of the story in general, but that's probably just personal preference! Other than that, this book far exceeded my expectations - and they were already high. Plus, I was so engrossed that I finished the book within two hours... and I was in the middle of an awful reading slump at the time, so I think that speaks volumes! 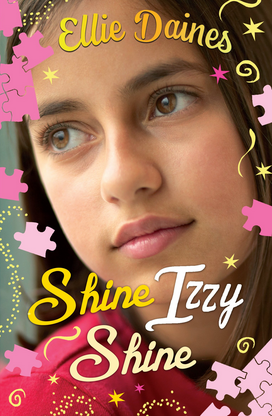 Shine Izzy Shine is completely fascinating and will tug hard on your heartstrings. This is the perfect book for you if you're looking for something different. Great review! I'm really glad you enjoyed this book and it helped you get out of a reading slump! It sounds like quite a touching story.